Adventures by Mom - Page 2 of 5 - Everything you need to know, but nobody tells you about when it comes to motherhood, marriage, and life in general. This is the first of a series of sponsored posts. Keystone Resorts provided complimentary activities for our family to enjoy during our stay. My boys have begged for years to take a “cold vacation.” They want to go where it snows. Harley wants to snowboard, and Harrison wants to ski, snowboard, and play pond hockey. Reading about and seeing all the photos from my sister and cousin’s travels inspired me to venture outside my comfort zone; to see the world beyond the house of the mouse (aka Disney); to try new things. My sister, Julie- the self-proclaimed slacker mom, went to Keystone, Colorado last year. My niece and nephew had a blast! The photos were beautiful. There were no major catastrophes. She said they had everything you could want or need in a small area, and plenty of resident experts to help newbies. 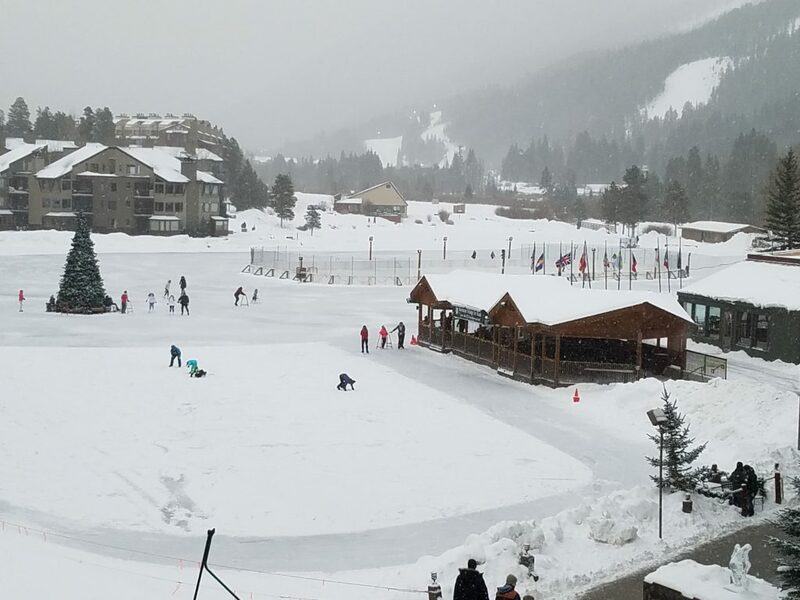 Snow – check; skiing – check; snowboarding – check; pond hockey – check. Looks like this could work. We decided to give it a go. A frozen 5 acre lake is perfect for a pick up game of pond hockey! I reached out to https://www.keystoneresort.com/ for information about ski vacations. They were super helpful, and incredibly knowledgeable. Once we had our dates narrowed down, they provided recommendations of places to stay, along with information about ski lessons, snow tubing, and other activities. I was grateful for the suggestions! I knew skiing, like other sports, requires specific equipment. Pants/ski bibs, jackets, boots, hats, helmets, goggles, gloves, multiple layers with moisture wicking, and special socks that are thin and stay dry. I had no idea how much it would be to outfit a family of 4. We were going to need a small loan! Thank goodness for friends with children about the same size who are willing to loan out their gear. With the exception of a few odds and ends, I think we have everything for everyone covered. We’ve mapped out our route, so we have a general idea of where we are going. We plan to drive from Houston to Amarillo. Take in some local Amarillo sights such as the Cadillac Ranch, and the Big Tex. The next morning we’ll head to Keystone. Google shows the drive to be sixteen hours without stops. Hopefully breaking it into two days will help. I’ll be sharing our adventures, along with what I learned on three different blogs – all from a different point of view and for a different purpose. You can follow along with me at http://adventuresbymom.com/ , https://theeducationaltourist.com/, and https://pixiedustqueen.com/. 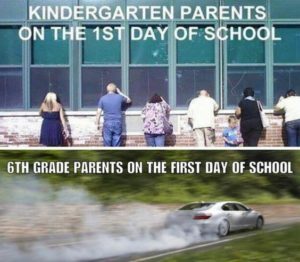 Over the years, I’ve noticed there are two kinds of moms when it comes to school starting each fall. There are the moms who are looking forward to their littles venturing back into the world of academia. They are the Woo Hoo moms. 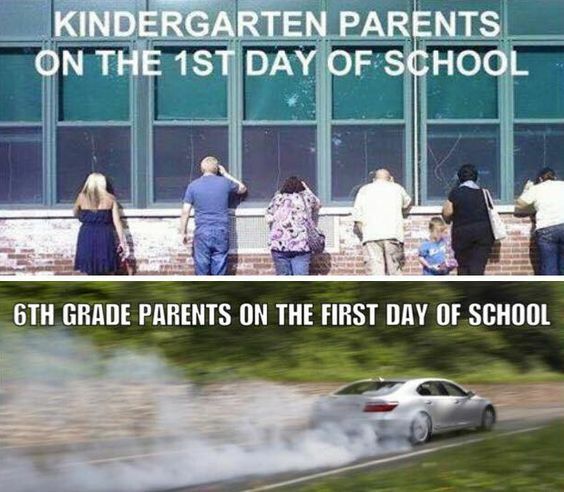 Then, there are the moms who dread the first day of school. They are super worried, and anxious about what will happen when their little steps into that building we call the school. Some moms know exactly which category they fall in, while others aren’t exactly sure. Let’s see what characteristics and activities you identify with to help determine if you are a Boo Hoo, or a Woo Hoo. You dread the school year starting. You are anxious about letting your little one go, to the point that every time you think about it – you end up in tears. You think homeschooling is a great option, except you really don’t have the resources. You’ve been known to cancel date night with the hubby because you couldn’t bear to be away from your little. 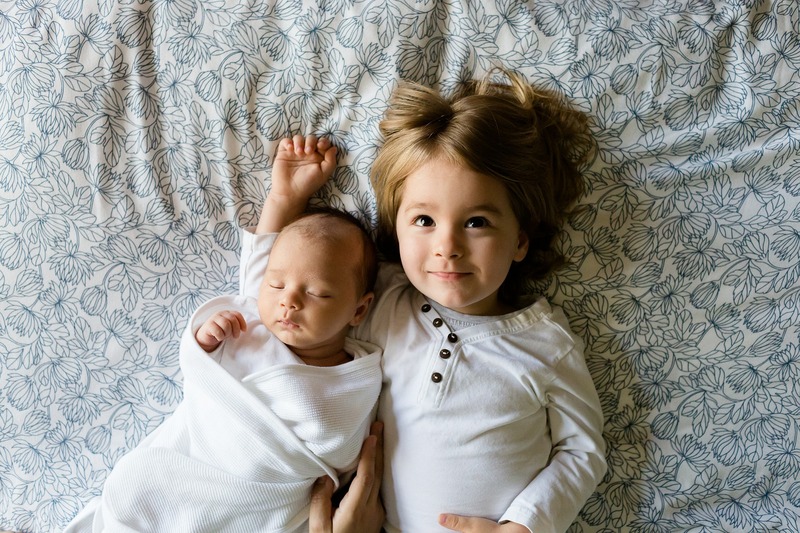 You are hesitant to leave your little one with grandparents, or other trustworthy family members. Basically, the idea of your little one growing up sends you into a tailspin of anxiety and panic. You don’t know what to do or who to be without kids underfoot. You haven’t had time to yourself in so long…what will you do? How will you feel? You haven’t had any job that didn’t relate to your child in so long you can’t remember what it was like? You love kid stuff so much you think your life will be boring. You love colors and crayons and Barbies and bows. You love long conversations on your 3rd and 4th favorite dinosaurs. You dread having to talk to grown ups in the grocery store and without your little one to distract you…you might make eye contact with someone. They might want you to talk to them! You are the ONLY one who understands your child. You worry that no one will be able to understand your child and his/her needs. Who will listen? Who will know when they are hungry? Who will help them with their shoelaces and buttons and buckles? You will be held to a higher standard of cooking and cleaning around the house. Have you been using the mantra “Cleaning the house while the kids are at home is like brushing your teeth while eating Oreos.”? (Yeah, me too.) Have you been saying you don’t have time to run those errands or make the bed or clean out the pantry because of the kids? Are you worried that now you’ll either need to clean the pantry or get a new excuse? You’ll be expected to have a hobby or exercise. People will ask you what you do with your free time and expect you to have something besides “look at pinterest” and “manage the dust bunnies” to say for it! Are you not ready to wear yoga pants like you just got back to the gym? You will be asked to volunteer. Do you panic at the thought of being asked to volunteer in the classroom? Do you panic at the thought of having to come up with Pinterest worthy ideas for games and teacher gifts? Back to School: Woo Hoo! You start counting down the days until school starts – on the first day of summer. You have an entire months worth of lunches planned. School supplies purchased as soon as the first display goes up. New backpack and lunch kit bought in late July. You love your children, but they are exhausting to keep up with all day. 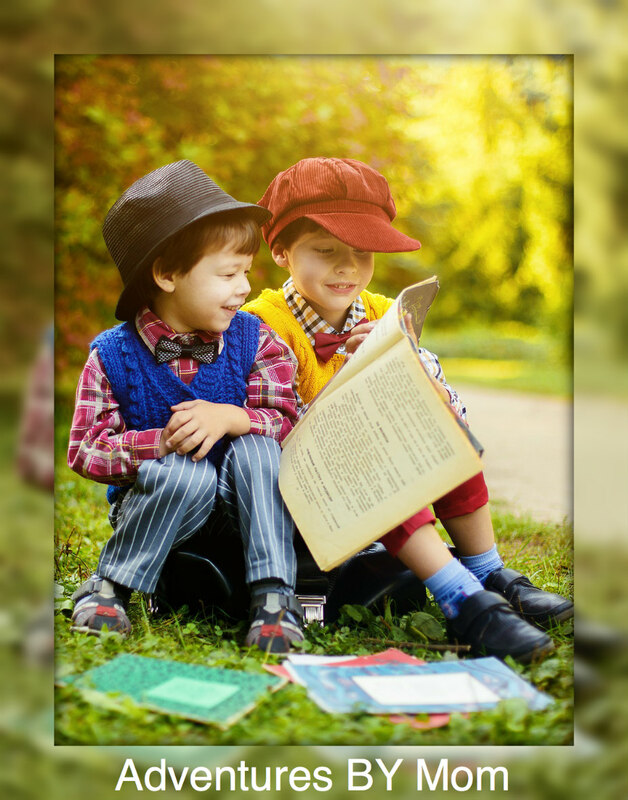 You are elated to send them back to teachers, who can get their brains going and growing; back to coaches who will make them exercise; back to friends who entertain them. You have your annual “Back to School Brunch” already planned with some of the other Woo Hoo! moms. Summer means you can’t remember the last time you had your hair done and your makeup done. 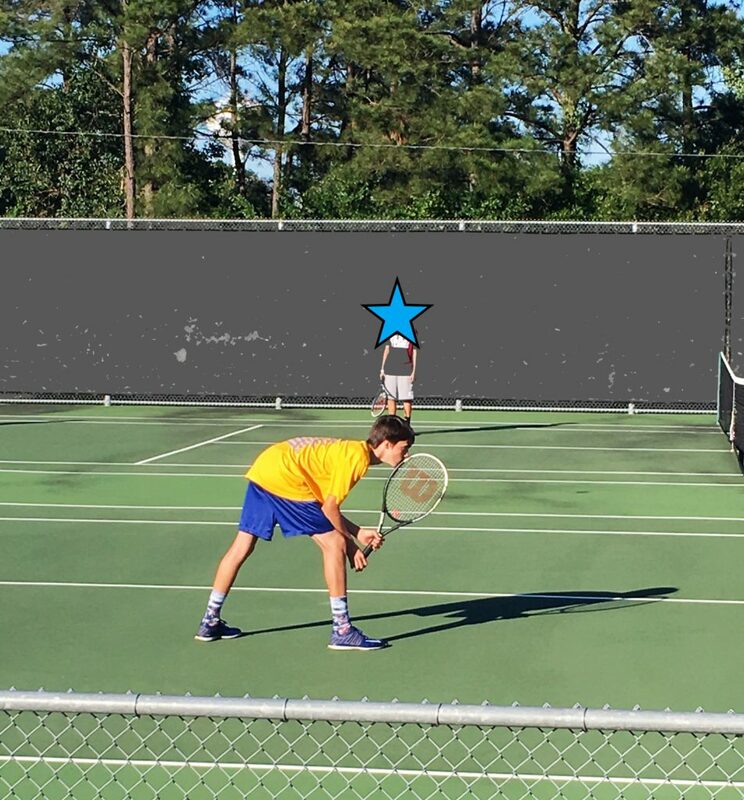 Summer means you have long, long long conversations about battles on Fortnite and memes. You watch other people play games on Youtube. Summer means no schedule for exercise. You can’t button your pants because the kids hate staying at the kid’s area of the gym and they insist on cookies for snacks and they don’t finish all the cookies so you do. Talking about which superhero is the toughest and which dinosaur would be able to win a fight between the T-rex and the Brontosaurus (T-Rex, duh) and pretending that the floor is lava and you must jump from pillow to pillow to cross the living room is all fun, but remember discussing …..anything else? Politics? Favorite show? Fashion? Wine? Yeah, me neither. Back to School: Can I be a bit of both? Absolutely, you can. A lot of moms start out as a boo hoo mom. But, as the little gets bigger, you both become more confident in your abilities to be away from each other. You also become more confident in the ability of others to care for you child. Some moms, are boo hoo moms for the major transitions – Kindergarten, Junior High, High School, and College. The random years that don’t mark milestones are Woo Hoo! But when the bigger changes come – so does the realization that the little is no longer so little. In fact, the little may now be taller than you! So my fellow moms, no matter which group you may fall in – when the first day of school arrives, give them a tight hug, take their picture, and let them begin the next chapter of their lives. I always wanted two boys and I had such daydreams of what that would be like. I would stand on the porch and wave to my boys as they headed out with their dad and grandpa to go hunting, fishing, and camping. I had this idyllic picture in my head of what it would be like to be the mother of two boys. Holy Crap! What was I thinking!?! No, you may not put your crayons in the toaster oven. Put your clothes back on, and LEAVE them on! There will be no sword fighting with the ceiling fan. Hot wheels do not go in the salad spinner. Let go of your wiener. I promise it’s not going to fall off. You may not attempt to get to your room by climbing on the counters, and furniture. You are not Tarzan, or George of the Jungle. You will walk! On the floor!! There will be no tattling. Are you sure you want to play fighting? Of course they play fighting. . . someone gets hurt. . .there may be minimal crying. . . but nobody dares tell momma! I’m off to enjoy my boys! More adventures await. Most people associate tea with England, but tea was actually discovered by accident in China. According to legend, an emperor’s water was being boiled when some tea leaves fell into the water. The emperor tasted the brew and found it a refreshing drink. The British tradition of tea began with the Duchess of Bedford in the 1800s. During that time period only two daily meals were served: breakfast and dinner. Anna, the Duchess of Bedford, wanted to have an afternoon snack so that she wouldn’t be so hungry while waiting on dinner. Sheinvted some friends to have snacks and tea. This became very popular with Victorian ladies who turned the whole affair into a tea party. The menu included an invention from the 7th Earl of Sandwich – the sandwich. 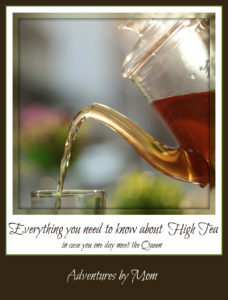 Originally there were two types of tea time – Low Tea and High Tea. Low tea was an afternoon snack for the upper classes and was taken between 3:00 and 4:00. It was very formal and usually eaten in fancy hotels like the Ritz. The menu include decliately cut cucumber sandwiches, scones or crumpets with jam and clotted cream, tea cakes, and of course, tea. Today this is called ‘High Tea’. For the working class, High Tea is the evening meal that we call dinner or supper. It was the main evening meal eaten when everyone got home from work usually between 5:00 and 6:00. The menu was heavy and included items such as roast beef and mashed potatoes. Sometimes High Tea was eaten at a tea shop or restaurant. The phrase “High” tea refers to the way tea was originally taken – at a tall stool in a tea shop or standing up near a buffet table. Today High Tea is called ‘tea’. *Sugar is added after the tea is prepared. *Milk is added to the cup before the tea is poured. *Milk is served luke warm so it doesn’t cool the tea too quickly. *Lemon is not offered to someone who has asked for milk because lemon juice will curdle milk. *Dipping things, such as cookies, into tea is not acceptable. *Tisanes, herbal or fruit teas, are not served. Tea is enjoyed in great quantities all over the world! It is second only to water in the amount consumed. In the United States, tea is a popular beverage at any time of day. While 44 billion cups of tea are consumed in the United States each year, most people don’t know much about tea. All they’ve seen in the Lipton tea bag. People are really missing out because there are more than 3000 varieties of tea flavors. Black tea helps you lower your cortisol levels/stress hormones. Drinking black tea helps you recover from a stressful situation. What parent can’t use that?? There are actually 4 different types of teas: white, green, black, and oolong for you to choose from when you are craving a spot of tea. They are all the same leaf from the Camellia Sinensis plant, but the leaves are processed differently. White tea is pretty rare. This type of tea is made from the buds of the plant rather than the leaves. The buds are dried without any processing. 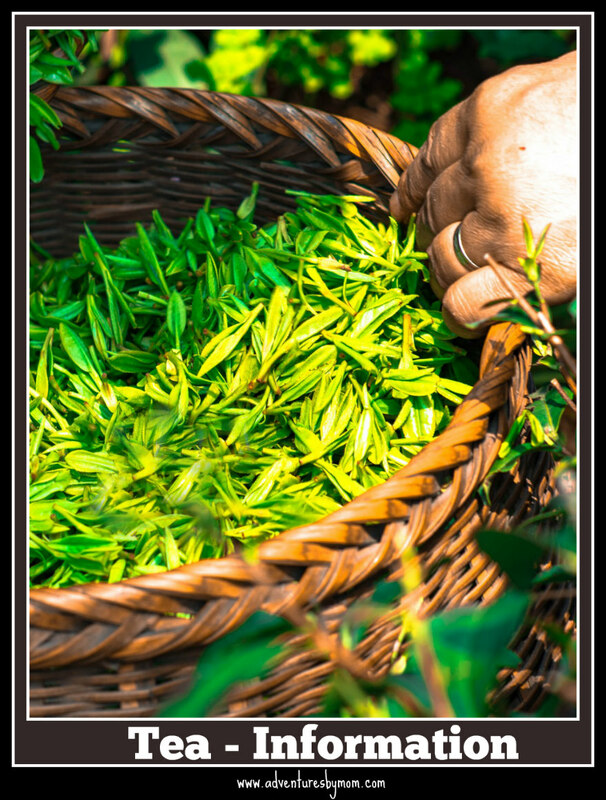 Green tea is lightly processed and has a light and mild taste. It is served in Asian restuarnas because people in the Orient prefer this type of tea. Green tea can be flavored, too. Green tea is the most studied type of tea because the first medical studies on tea were done in Japan and China where green tea is most popular. Later studies have shown that all tea can be very good for you. 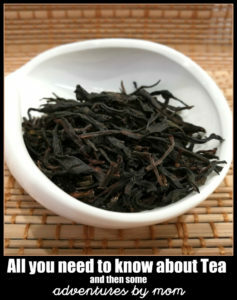 Black tea is the most common tea in the United States and England. It is green tea that has been fermented for about 6 hours. Fermentation turns the leaves black. 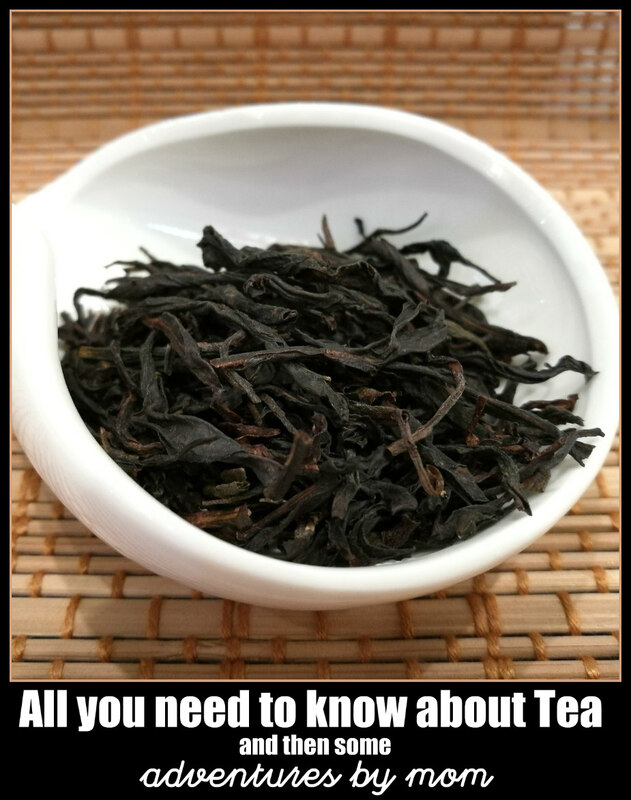 Oolong tea is semi fermented which means that it isn’t fermented as long as the black tea. This tea is popular in Taiwan and China. This one is my favorite and has a really different flavor than black or green tea. Tea leaves are graded. 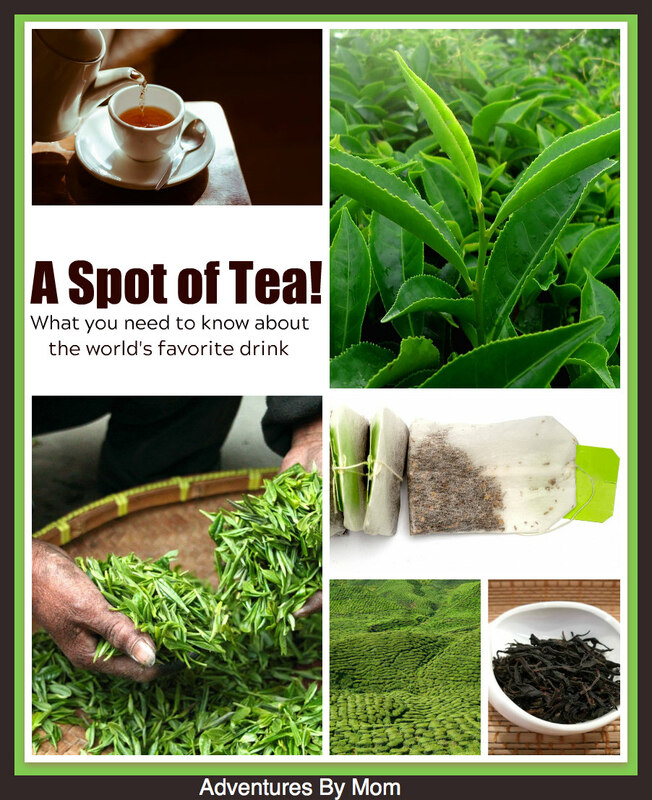 This means that tea leaves are ranked based on the quality and condition of the leaves. As you would expect, whole leaves without any damage are the most valuable and the least valuable is really just the crumbs and dust leftover from the processing. 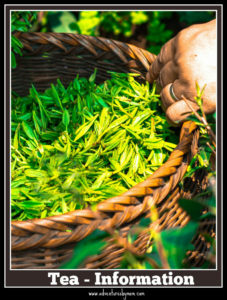 Tea is hand picked using only the balls of the finger tips. Using a machine or a fingernail would bruise the leaves. Fannings are the small pieces of tea that are left over after the higher grades are collected. Dust is the smallest pieces after leaves and fanning are collected. How do the grades of tea taste different? When you steep tea the flavor comes out of the part of the leaf that touches the water. So, the more parts of the tea leaf that touches the water the stronger the flavor. So, the cheap grades like fanning and dust are the strongest. *Tea makes your bones stronger! Studies to try to determine why weak bones, osteoporosis, is more common in Western cultures than in Asian cultures were held by Dr. Shen at Texas Tech University showed that drinking 4-6 cups of green tea daily gave favorable effects to those who had signs of pre-osteoporosis. The best teas for calming the gut are peppermint tea, anise tea, chamomile tea, turmeric tea, and fennel tea. *Tea improves your short term memory. A study in Switzerland shows that drinking green tea helps parts of your brain communicate in a way that improves memory. *Tea lowers your bad cholesterol levels. Tea lowers your LDL cholesterol (the type of cholesterol that clogs arteries). Several studies have shown that teas, both green and black affect cholesterol and can be a good part of a program to keep your cholesterol in check. What’s in a Lipton Tea bag? Dust! Open one to see for yourself. Tea contains lots of compounds called polyphenols. These compounds work in your body to keep you healthy. They can help prevent wrinkles, hear disease, cavities, and cancer. One study showed that fruit flies who drank water with green tea lived 20% longer than the other fruit flies. This suggests that drinking tea may increase longevity in hans. Also, drinking tea has proven to lower your risk of stroke and shorten the duration of a cold or flu. Experiments have shown tea to stop cancer growth and shrink cancer tumors. Green tea has also proven to be effective when applied directly to the skin so many cosmetic companies are now adding to their products. Tea contains 2 substances that act like antibiotics: tannin and polyphenols. These substances kill the bacteria that contribute to tooth decay. Additionally, tea contains fluoride which also gives teeth some protection from decay. Each cell in your body has a coating with a really long name __________. For ease in the paragraph, let’s just call that coating BAD. Bad is a protein that causes cells to grown bigger. When cells reach a certain size they divide. This is good when you are growing new eyelash cells, but not good if you are growing cancerous cells. One compound in tea, again with a really long name _______, let’s just call this one GOOD, stops the BAD from working. If BAD isn’t working then the cancerous cells don’t grown and divide. Instead, they just shrink and die. The shrink and die process is called apoptosis. Tea has been shown to prevent cell mutation, prevent growth of cancerous cells, and shrink cancerous tumors. The benefits of cinnamon tea are many! Cinnamon is actually the bark of a tree and cinnamon tea doesn’t have any leaves from the Camellia Sinensis. The active ingredient in cinnamon tea is cinnamaldehyde but other compounds also leach from the cinnamon bark when you make tea such as coumarin, linalool, cinnamic acid, proanthocyanidins, and catachins. *****Too much cinnamon tea is bad for you! Use in moderation. It is estimated that drinking one cup of tea an hour would be required to keep the GOOD levels in your body constant. So drink tea frequently throughout the day. More tea is better because the more you drink, the more you lower your risk of dying from heart disease, cancer, and premature aging. In the studies the subjects drink 3 cups of the per day, but even one cup of day will give you some benefit. 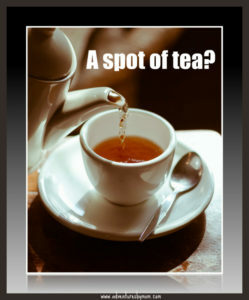 There is one exception; however, tea contains tannins which interfere with the absorption of iron. So make sure you don’t take your iron supplement within an hour of drinking tea. The tea bag was invented in 1908 by Thomas Sullivan in New York. It allowed tea to be made without the mess of loose tea leaves and quickly became popular with restaurants. The tea bag didn’t find popularity in England until the beginning of public television. At that point, commercials were too short to brew a proper cup of tea, but the tea bag shortened the process. A tea bag made it possible to have your cup of tea and not miss any of your favorite television show! To caffeine or not caffeine, that is the question. Tea has roughly half the amount of caffein as coffee. However; some people don’t like to drink caffeine at all. Fortunately, tea can be processed to remove the caffeine. This process doesn’t lower the affects of of the polyphenols or change the taste. Decaffeinated tea is the best of both worlds! Iced tea was invented at the World’s Fair in 1904. The World’s Fair in St. Louis that year and it was very, very hot. Richard Blechynder, a tea plantation owner, traveled to the fair with the intention of introducing his tea by giving away samples. People were not interested in his hot drink and Mr. Blechynder was worried about losing the money he had spent on his trip. He poured his tea over ice and voila, iced tea was born. It never caught on in Mr. Blechynder’s homeland of England, but it is still the preferred choice in the United States. The United States is the only country in the world where iced tea is served more than hot tea. Sweet Tea or Unsweet Tea? One way to drink iced tea is called ‘sweet tea’ and is commonly found in the south of the United States. Sweet tea has been consumed happily in the US since 1879. Sweet tea is not just tea that sugar is added to. When you order unsweet tea and then pour sugar or a sweetened like splenda you do NOT get what is officially known in the south at ‘sweet tea’. Sprinkle baking soda into 64 ounce glass pitcher. It is a good idea to prime the glass with some hot water from the tap so the shock of boiling water doesn’t break the pitcher. Add the boiling water and then add tea bags. Cover and allow the tea bags to steep for 15 minutes. Set a timer because of any more than that and the tea will get bitter. Stir in sugar until it dissolves. Then add cool water and stir again. Refrigerate until it is cold and serve over ice. I love to add a sprig of mint to the top. It is pretty and tasty, too! Some people love a slice of lemon added to their tea but for me it ruins the sweet taste! Don’t leave out the baking soda! It neutralizes the tannins and makes the tea less bitter. I personally enjoy drinking my sweet tea warm in a pretty tea cup. Should you add anything to your tea? Some people like to drink their tea plain while others like to add something to it. Additions include: lemon, milk, honey, mint leaves, or a sweetener. None of the additions take away from the benefits of drinking tea. In England, tea is sometime taken with milk. This tradition started because tea was so expensive. The upper class took their tea without milk because they could afford it. The middle class drink their tea with a little milk to make the tea go farther. The lower class drank milk with a little bit of the expensive tea added for flavor. The most common sweetener is sugar. You can use table sugar but rock candy use as a swizzle stick adds sugar and is really cute, too! Just stir the hot tea with the swizzler and the sugar will dissolve and sweeten the tea. Kids love this! Artificial sweeteners like sucralose, aspartame, and saccharin. Flavors are fun, too. Luzianne makes several liquid flavorings like Strawberry-Kiwi, Raspberry, and Peach. Tea can also act as a natural deodorant. The tannins in tea act as an anti perspirant. Sweaty feet, for example, can be soaked in tea for up to 20 minutes and will smell sweet for up to 3 days! Tea bags can be used to lessen puffy eyes. Let the tea bag cool after you brew your tea. Then, place cool tea bags over your eyes and lie down for 15 minutes. Tannin in tea also encourages clotting of blood. Tea bags can be used when a baby tooth falls out. Have your little one bite on a tea bag after a tooth falls out to stop the bleeding. Tea from the camellia plant is not to be confused with the herbal tea of fruit tea. Herbal and fruit teas are not made with actual the, but instead used the leaves, bark, stems, etc. of other plants. Europeans use the term tisanes when speaking of herbal or fruit teas. Herbal teas can be used for a variety of purposes, Popular herbal teas include: peppermint, spearmint, chamomile, and fennel. Each herb offers a different benefit without caffeine. Chamomile and Kava Kava teas are used to promote relaxation so they are great teas to drink before bedtime. Chamomile and mint teas are used for an upset stomach. Fennel tea can be used as a mild expectorant. Ginger tea can be a great remedy for motion sickness and is also used for symptom relief with migraines and arthritis. A 12 year study in China of people who drank tea showed that people who drank black tea every day – about 6 days a week, were 71% LESS likely to develop Parkinson’s disease. Furthermore, the study showed that more is better so the more tea you drink the less likely you are to develop the disease. The polyphenols in teas have anti- inflammatory effects. The most effective polyphenol in green tea is epigallocatechin 3-galllate and it is 100 times stronger with antioxidant effects than both vitamin C and E.
All of the above and tea is delicious! Enjoy a cup today and feel good about it, too.